Palm House wedding photos show the prime space for wedding receptions at the Brooklyn Botanic Gardens. As a wedding photographer, the Palm House is a venue that takes wedding attendees out of the city and into a little piece of paradise. Palm House wedding photos showcase the splendor of the glass enclosed building. This is the highlight of venue and from every angle guests can see the scenery of the Botanic Gardens through the windows that surround them. This photo shows the beauty of the structure’s windowed ceiling. The windows panes are lined with dark frames, creating a checkered effect over the brilliant blue sky that covers the scene. Inside the Palm House, the mother of the bride prepares for the big day. The mother of the bride looks out at the room, all set up to receive the wedding guests who will soon be celebrating within it. Also in her view are the gardens outside the windows in full bloom. These gardens are magnificent regardless of the season. In the summer months, which is when this wedding took place, a variety of lilies and roses are scattered throughout the grounds. Brooklyn Botanic Gardens. Her expression is approving as she appraises the sights before her. 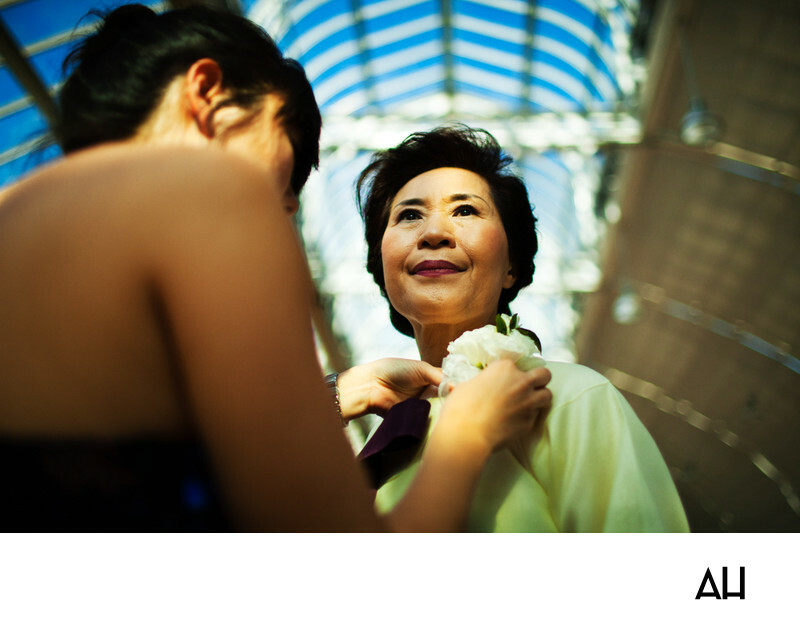 While she observes the venue, a bridesmaid works to attach white flowers to the mother of the bride’s blouse. The bride’s mother is regal, like a queen, standing tall with her head held high. She is delighted to be present for the events of the day and proud of the woman her daughter has become.